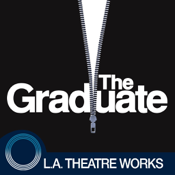 The Graduate (by Charles Webb) is presented by L.A. Theatre Works. This standalone audiobook app combines a professional audio recording with supplemental features for download-once, grab-and-go anywhere enjoyment. An American classic adapted for the stage, starring Kathleen Turner as Mrs. Robinson and Matthew Rhys as Benjamin Braddock. A fresh-faced college grad returns home, diploma in hand, to seek an answer to that age old question: “Now what?” Lacking any clear career path, he falls prey to the original “cougar”, the predatory Mrs. Robinson, wife of his father’s business partner. But it’s Mrs. Robinson’s daughter who captures his heart. Includes and interview with the star of The Graduate, screen legend Kathleen Turner. Adapted for the stage by Terry Johnson, based on the novel by Charles Webb and the screenplay by Calder Willingham and Buck Henry. Directed by John Rubinstein. Recorded before a live audience at the Skirball Cultural Center, Los Angeles.